Representatives from 25 of the world’s leading employers and 27 of the world’s top business schools attended Connections 2011 "Critical Dependencies in MBA Recruiting” hosted by MBA Focus in Columbus, Ohio. We are very proud that this conference continues to be the premiere event for MBA recruitment. We truly appreciate the ideas, comments, and willingness to share year after year. This kind of rich and open dialogue makes it possible for all of us to succeed. Below is a list of key thoughts, discussion points, and takeaways from the presentations, moderated panels, and keynotes that you missed. Please keep these in mind as you prepare for the upcoming season. Feel free to call or email us with additional thoughts. You can also post your comments on our MBA Focus Facebook page. MBA Focus makes it easier to do your job! 96% of client contacts, and 93% of users would recommend MBA Focus. The future of MBA Focus includes virtual interviewing, new user interface, integration with social networks, and mobile applications. Schools admit: "MultiPost is a big value proposition for us!" Employers confirm that more energy and emphasis is placed on sourcing activities: "Post and pray is dead." "Phone calls are not the best way to screen candidates...Virtual Interviewing can only be a good thing and help improve the process." 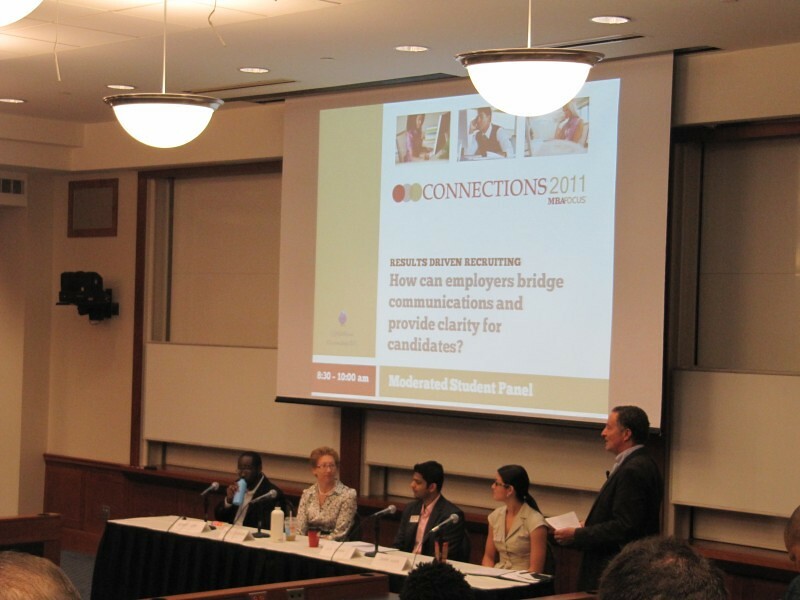 MBA students agree that CMO/CSO/CMC still play a major role in employment process. Schools only place a small percentage of students in jobs through OCR (on-campus recruiting). GMAT scores are not a predictor of employability; it is used to predict how successful a student will be in an MBA program. Schools are admitting on potential just as employers are hiring on potential. Buzzword = PERSONAL. MBA students want personal touch to offers and communications. Want to feel wanted. But don't invade personal space. MBA students agree Facebook and texting is personal space. LinkedIn and email is more professional. And email is still the preferred method of communication during the recruiting process. Students think location, salary, flexibility, etc important when accepting job offer. But it is better if a company really WANTS you and INTERESTED in you. Informative Q&A on the new DOJ ruling about discrimination in job postings based on citizenship vs. work authorization. Check with your legal counsel. We hope to see you next year! Please Save the Date for Connections 2012, which will be held April 30–May 2, 2012, in Columbus, Ohio.